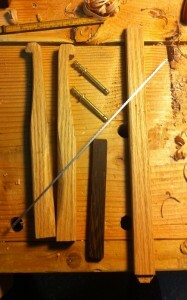 A while back I was torn between splurging on a Gramercy Turning saw, or a simple (but quality) coping saw. In the end I compromised, by getting the Olson Coping Saw (no regrets there, great tool) and buying the parts for the Gramercy Turning Saw. Last night I was in a mood, and needed to break out of a funk so I went down with the intention of cleaning the shop, or maybe marking out a box using whole number ratios. Instead I made a turning saw from the kit. It went surprisingly quickly, and I was able to put it together in about two hours all told. I used some straight grained oak 1×2 I had picked up at a Home Center, and cut it down to size. Rather than try to rip the length down on such a small piece, I just put it in the vise and planed off the excess to my line with a Jack plane. I used another small bow saw I had picked up at a salvage place (with a terrible blade, so I never use it) as a pattern and went to it. I cut the arms to length, and traced the outline of the existing bow saw onto the wood. I cut out the head shape, and the curve with my coping saw and chisels. 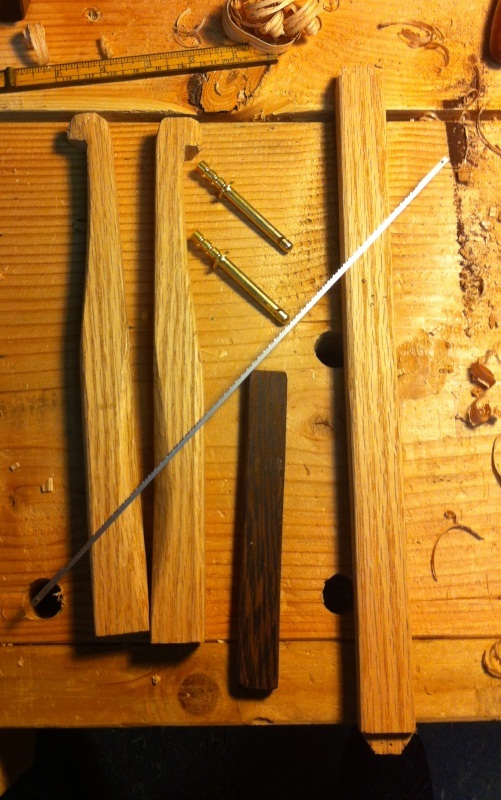 I then used my spokeshaves from Lee Valley to smooth out the rough spots and a some rasps to smooth the head a bit. I need better rasps I have decided, but that’s for later. I drilled the hole in each arm with a eggbeater drill, and while they were a bit off center I don’t think it will matter much in practice. Inserting the pins into the arms, and slotting the blade in, I measured the distance between the arms, and used that for the cross bar length (adding a little for the small tenons). This was my first time cutting a mortise and tenon in a really long time, so I took it slow but it thankfully went together pretty quickly. I used a 1/4″ Narex mortise chisel to carve the trench (after a quick honing) and after a little fumbling I got the movements down pretty quickly. Then I cut a small tenon on each end of the cross bar to fit each side, and cut the corners of the tenon to allow it to move a little side to side as the frame is tightened and loosened. 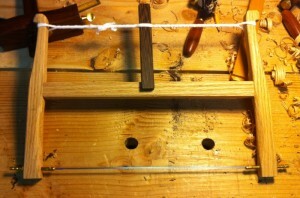 If it was left square it could cause issues as it tightened. Once this was all fitted together, I grabbed a scrap piece of Wenge and some string that I will replace later with some tough twine, and tightened it up. I was able to get good tension, and it held together really well. I took it back apart, and shaped the hand hold area with the spoke shaves and made sure all of the edges were rounded. Next step will be to glue up some blocks onto the brass pins, and turn a couple of nice knobs. Right now my lathe is buried under the wood for my new work bench, but it will work like this for now if I need to do any fret sawing . All in all I’m pleased with this project, and how quickly it came together. I would highly recommend the kit to anyone who needs it. As always Gramercy Tools are top quality. You’re going to really like that saw! I made one a couple of years ago and go to it amazingly often. @Bob, thanks! I can tell it will be quite useful and as a bonus i was able to shape the handle to fit my hand exactly. Looks like it was a fun project, it came out great Badger! I used it last night cut out dovetail waste out of some pine, and it was fantastic! I was able to quickly (once I learned how to hold it) remove waste, nearly to the line with minimal clean up. Badger – is the kerf width, does it fit into the cuts from your DT saw? @McGlynn, yep it does. I have Lie Nielson Dovetail saw, and the blade fits right in. I’m using the coarsest of the three blades that came with, and haven’t tried the others yet. Tonight I’m going to finish the dovetails I started last night, and I will try another blade. I was looking at the turning saw parts on TFWW recently, and while browsing around looking for related information I noticed that Roy Underhill built one on his show recently. It has a unique toggle for tightening it, that locks into a mortise. It’s a little more “swoopy” than the Gramercy patterns, and I like the dark finish on the original one. OOoooh, I think I’ll watch that right now!